Workout Expectations: Late beginners that push themselves can expect to gain about 1 pounds of muscle per month during the first 3 months on this workout. Workout Rest: Rest no more then 2 minutes between sets. For taxing lifts such as deadlift and squats, you may rest as long as 3 to 5 minutes in between sets. 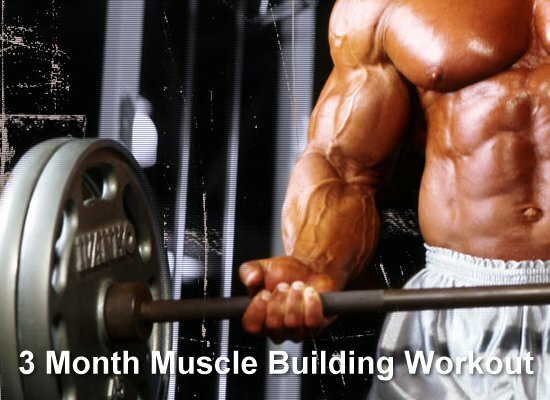 This muscle building workout is for late beginners to intermediate bodybuilders who wish to add muscle mass and also add strength, and need a new or different training approach. When starting the program, use your best guess at how much weight will be appropriate for each set. Make adjustments as necessary. Make it a goal to try for more reps on every set of every workout. This is called progression of weight. When you can perform the top number of reps listed for an exercise set, add weight the next time you perform this exercise. Never waste a set. Always push yourself for more reps and more weight. Eat big! To gain muscle mass you must eat more then it takes to maintain your weight. Failure to adhere to either of the 2 points listed above will result in a limiting of progress. Where the Abs workout in this program???? Hii, Somebody help me to gain muscles.My age is 17 from india. i am very weak. 5.1 height 43 weight..